City Walk is already a great place for families to spend the day: it has indoor/outdoor flow, the Green Planet ‘bio dome’, plenty of family-friendly restaurants (we love the famous-in-Beirut spot Enab) and then there’s Mattel Play Town (where little ones can meet their favourite characters, including Bob the Builder, Barney and Thomas). And this month there’s even more, with parts of the destination transformed into an under-the-sea-themed wonderland to celebrate Dubai Summer Surprises. Every Friday and Saturday there’s an Under the Sea live show at City Walk, with performances at 4.30pm, 7.30pm and 9pm (you’ll find it right next to Hub Zero). The production involves acrobatics, dance and storytelling, and follows a strong-minded mermaid and her sea creature friends. Children will be carried away by the costumes, scenery and stage setting, and everyone will be impressed by the LED lighting (which makes the experience very immersive). The best bit is that the show is completely free for families to watch, all you have to do is spend Dhs200 at any City Walk outlet and you’ll get entry to the show for two adults and two children. So why not go out for lunch, and then head to the show for free? Or you could make a nature-filled day of it: visit the amazing Green Planet (tickets are Dhs95 for adults, and Dhs70 for children) and then finish your afternoon off with the Under The Sea show. You’ll also be able to visit the Mermaid’s Hideout (next to Hub Zero) from 4pm to 10pm Sunday to Wednesday and 2pm to 10pm Thursday to Saturday. Over these times kids will get to try and build sand and popsicle stick art, and there will also be loom art stations, live magic shows, a balloon artist and much more. 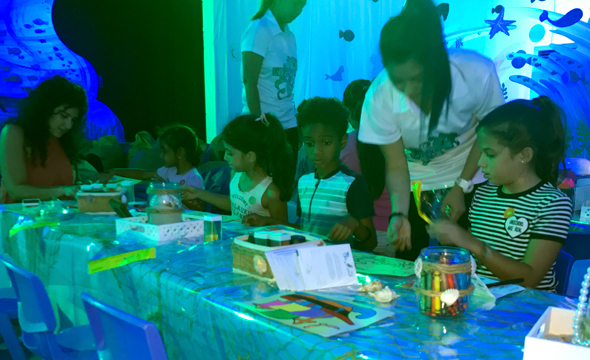 Crafts in the Under The Sea zone. 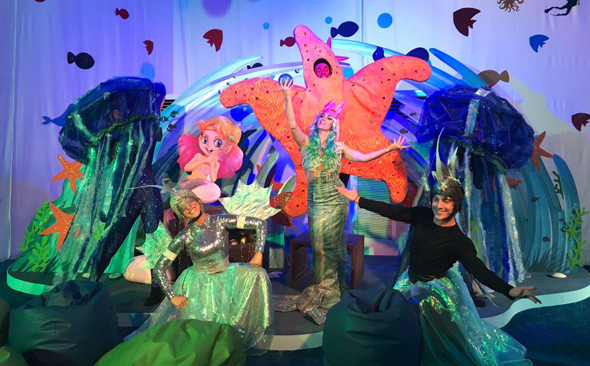 The stars of the Under the Sea show will be milling around the Mermaid’s Hideout for photo opps’ with their mini fans. And photo opps’ with the stars of the show! 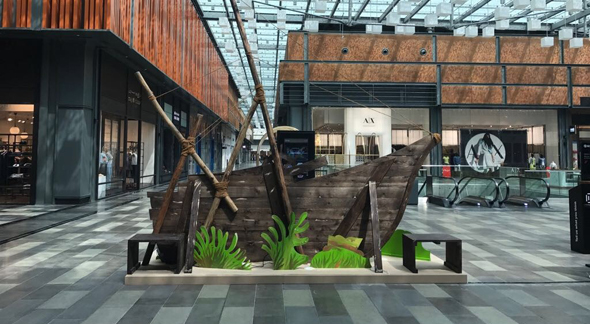 There will also be an interactive, sea-themed treasure hunt over these times – mini detectives will have to find a secret word to gain access into the Mermaid’s Hideout and win prizes. Start at the City Walk information desk, where you will be able to collect a map to help you find the hidden clues at The Pirate’s Cove in the indoor courtyard and The Giant Pearl at the City Walk fountain. The ideal family day plan? Go to Clinton Street Baking Company & Restaurant, Babaji or Sarabeth’s for brunch, then head to the Green Planet before finding the City Walk information desk to set off on the treasure hunt. You can then wind things down with the live show. Remember, there are plenty of family-friendly activities at City Walk: here’s a full list. Just head to City Walk at these times and ask the friendly info’ desk for more details. Plus, follow City Walk on Facebook for more updates on the Under The Sea fun. The Under The Sea fun runs until August 12 at City Walk New Expansion, Dubai. More info on website.